Delcam is pleased to announce that the company recently added its 40,000th customer – Lifetime Products Inc. “Lifetime Products is a world-leading manufacturer, with products sold in more than 70 countries. We are honoured to be able to add such a prestigious company to our list of customers. They are a true US success story,” said Delcam North America President, Glenn McMinn, who announced the landmark sale during the IMTS exhibition in Chicago. While the average American may not know who Lifetime Products is, the chances are they own one of its products. The company manufactures a number of outdoor products from swing sets and basketball hoops, to lawn furniture and storage sheds, to kayaks and tent trailers, all designed and manufactured largely in the United States. Founded in 1986 and headquartered in Clearfield, Utah, Lifetime Products has applied innovation and cutting-edge technology in plastics and metals to develop innovative products with superior strength and durability. It all began in 1972, with the founder of Lifetime Products, Barry Mower, wanting a sturdier basketball pole for his backyard. This grew into a business that was named American PlayWorld. Several years later, in March of 1986, Lifetime Products was created to concentrate specifically on manufacturing the patented adjustable-basketball systems. Today, Lifetime Products employs over 1,300 staff in 2.6 million square feet spread over twenty-one separate buildings. Lifetime Product’s commitment as a global manufacturer is to produce high quality, innovative products that are strong, durable and environmentally friendly. To meet its goals and to keep costs down, Lifetime Products continually looks for solutions to speed up time to market, to increase value to its customers and to decrease waste. The Lifetime Products machine shop, staffed by 21 experienced machinists is an integral part of the company’s success. The machine shop purchased its first Mazak more than 20 years ago, which was just recently sold to make room for a new and bigger Mazak. Today, the company owns four Mazak vertical machining centres, including two Nexus VNC-510Cs, a Nexus VCS-410A, a VTC-300C and a Mazak QuickTurn Nexus 300 turning centre. 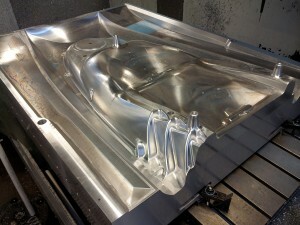 Lifetime Products also has four HAAS VF-9 machines for milling its moulds. The company is expanding this department further, installing a new HAAS VS-3 in early October to meet the growing demand for moulds. Just recently, Lifetime Products expanded its offerings to include kayaks in its line of outdoor products. The company uses PTC’s Pro-E for the design but wanted a state-of-the-art CAM product to go alongside it. Since the company’s designs can be quite complex, the machine shop had to find something that would take the large files without difficulty, something that could compliment its current processes but extend its CAM capabilities. After reviewing a number of CADCAM companies, Lifetime Products decided on Delcam. “What attracted us to Delcam first was the PowerMILL CAM package, especially the speed with which it can calculate toolpaths,” said Mr Norman. “It is not uncommon for software companies to say they have fast toolpath calculation but PowerMILL backs this up with multi-threading and background processing. It automatically performs complex calculations in the background while we can continue to work on other toolpaths.” This functionality is unique to PowerMILL – both foreground and background processes that use fully multi-threaded functionality so NC programs get to the machines in the shortest possible time. Lifetime Products has been so impressed working with Delcam that the company has also purchased the FeatureCAM feature-based CAM system for its shop floor operators. Kelly Martinez, the Machine Shop Manager, said, “We were impressed with the diversity the company could offer us and how attentive the people there are to our needs.” Most of the job-shop parts machined by Lifetime Products had been programmed using the Mazatrol off-line programming system for Mazak CNC machines. Due to the ease of use of FeatureCAM, Lifetime Products has really increased productivity on its shop floor. “Previously the shop floor operators would have to get one of the programmers, who are very busy programming complex moulds, to do work on smaller surfacing projects. Now, with the help of FeatureCAM, we can do a lot more programming right on the shop floor,” explained Mr. Martinez.